Let it be said that getting back to Postcrossing has been one of the best decisions I recently made. Why? Happy mailbox equals a happy me! I stocked up on postcards and stamps. I bookmarked pages with quotes on writing letters and sending mail. I even established a pattern, or maybe you could call it a schedule, because there's no harm in a bit of a routine. Sunday is now my dedicated Postcrossing day when I will request new addresses in the afternoon, sip some hot tea while thinking about brilliant things to write on the cards, and sending them on their merry way on Monday morning. Depending on how many of my previously sent postcards got registered during the week I usually send out between three and five new cards each week. On the receiving end it has been a bit more quiet than last month, then again some countries still use donkeys to transport mail, so it might take a bit longer for them to arrive or, as a wonderful alternative, they are being shipped in from far off exotic lands like, say, Christmas Island. 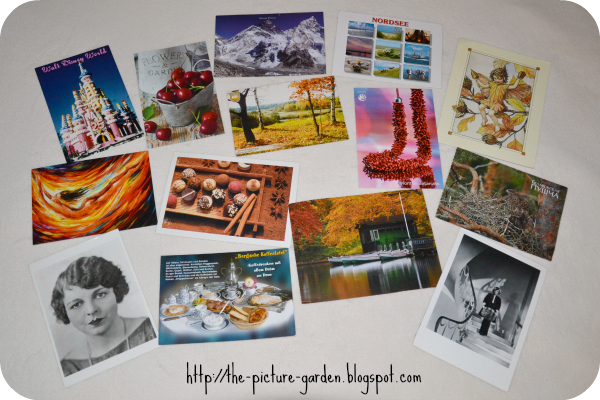 Have you heard about Postcrossing before? Or maybe you already are a happy Postcrosser? Let me know! never heard about this before, but it sounds like great fun! have a nice sunday evening, writing and reading!